Getting to Art Basel Miami Beach from my downtown hotel turned out to be fraught with delays, both with respect to getting out the door and — more so — finding a place to park in that clusterfucked-up traffic. But get there I did, eventually, and soon I was joined by Rice University professor and artist Christopher Sperandio — a frequent collaborator with British artist Simon Grennan — who, although devoutly heterosexual, makes an excellent wingman at gay bars. We walked around taking the works on view with the appropriate seriousness their pricetags demanded. 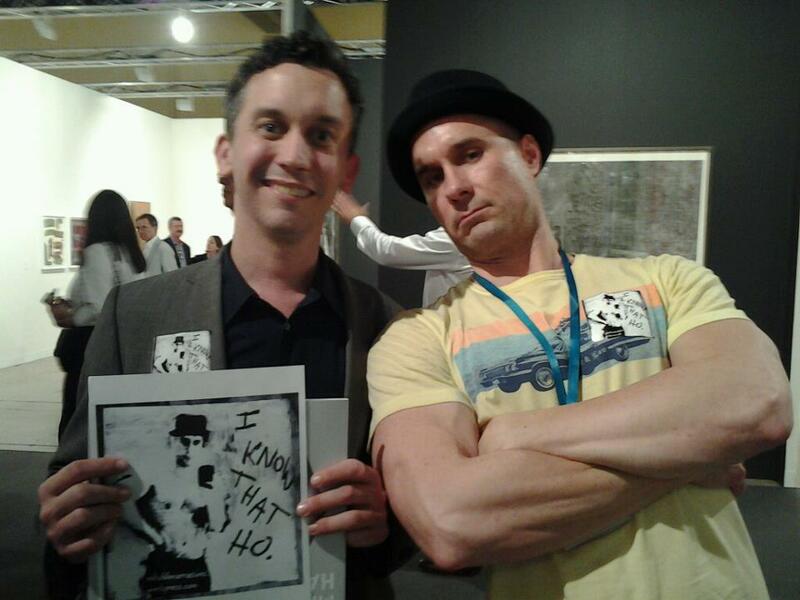 My wingman was also my documentarian, snapping “I know that ho” photos with various art-world luminaries we encountered as we roamed the booths. Photo gallery, which includes “I know that ho” photos, pictures of art I’ve seen on the trip, advertising photos of yours truly, here. (We also took photos at a party for alumni for the School of the Art Institute of Chicago and at a NADA party. Slowing our progress: The stickers are surprisingly difficult to unpeel. So after I pick of the remaining stickers from the printer I’m going to look for wax paper or something similar to stick them onto, so we I approach people I can have them already pre-peeled and ready to go.